When the circus is in town there is just one larger than life archetype to fit the bill. A classic stilt walking performance served up by some serious dishes, Ringmasters can present acts, direct audience attention and maintain the smooth running of a night, but can also perform in their own right. 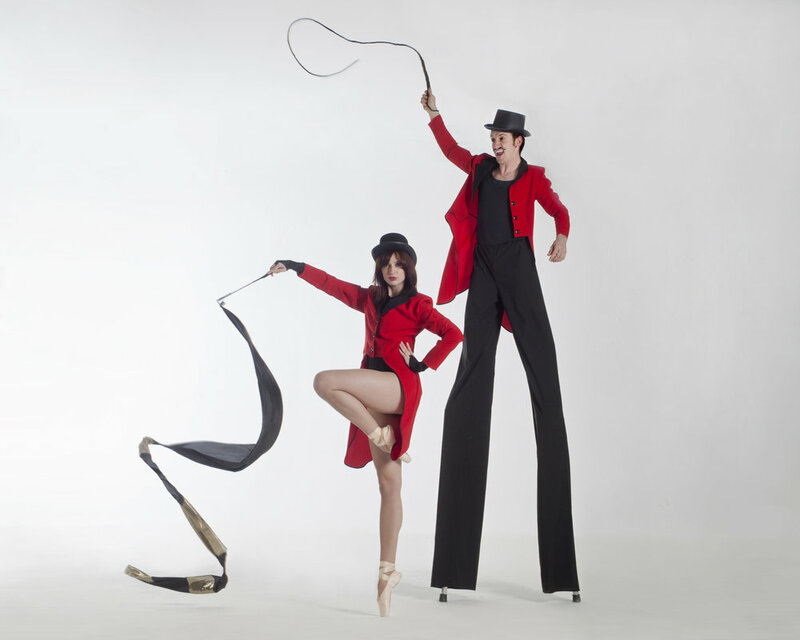 Extrovert and interactive stilt characters can ensure your audience is thoroughly warmed up; on foot Ringmasters are perfect with a whip-like ribbon or as a fire performance, including fire eating, fire breathing and fire juggling as speciality acts, but can work with any movement discipline you can imagine. All of our costumes can be fitted with bright lights for lashings of Vegas kitsch, and can also wear their own music/ sound effect boxes. Gorgeous circus themed entertainment, for discerning clients seeking circus performers for hire with lashings of luxe.